Weighty Matters: Walking and cycling to work prevents obesity? I'll admit up front that I can't access the full text of the article Walking and Cycling to Health: A Comparative Analysis of City, State, and International Data, so I can't comment on methodology. The study was large in that it looked at 14 countries, all 50 US states and 50 of the largest US cities for a relationship between active transportation (walking and cycling to work) and obesity. The abstract (and the media) strongly suggest that walking and cycling to work helps to prevent obesity. Now there's no doubt that a daily human powered commute, unless you happen to live next door to work, would in fact burn a significant number of annual calories and consequently could easily play a role in weight. There's also no doubt in my mind that at least here in North America, it's a rather unique person who walks or cycles to work. Anectdotally I can think of 4 people off the top of my head who without fail cycle to work, rain, shine, sleet, snow or hail. Whether or not all daily human powered commuters are health nuts isn't something I can claim, but I'd be willing to wager that the lifestyle habits of human powered North American commuters are dramatically different than the folks who rely on internal combustion engines (Europeans may be different as their built environments may make walking or cycling a more commonplace choice). At the very least, controlling for the dietary choices of the self-propelled would be extremely important in the correlation/causation discussion, and while I can't with any certainty claim that the authors didn't control for diet, if they did, it'd have been a herculean feat given how many different geographic locations they studied. But let's say that's not the case. Let's say that in fact diet's not a player in these findings. Now let's look at Great Britain. According to the Journal of Physical Activity and Health, nearly 40% of folks in Great Britain walk or cycle to work as you can see in that graph up above. According to that same graph, obesity rates in Great Britain are up at roughly the 22% mark. Australia and Canada, both with rates of obesity nearly identical to Great Britain's, show active transport rates 1/4 and 1/2 of Great Britain's respectively. Shouldn't Canadians and Australians be markedly heavier (or Brits markedly lighter)? Ok, so a couple of outliers don't disprove everything do they? Fine. Well how about time? Wouldn't rate of change over time matter more than absolute rates when it comes to a discussion of obesity rates and the impact of an intervention that presumably had been there as part of the culture, prior to the most recent sets of measurements? 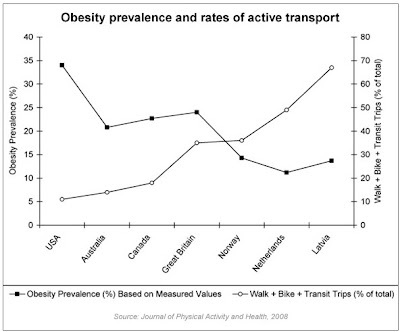 What I'm getting at is that if active transportation is indeed an effective vaccine against an increasingly obesogenic environment, then perhaps we might expect to see not only lower rates of obesity, but also slower rises in those rates in countries where there is more active transportation. Looking at Great Britain again, according to the BBC, obesity rates have nearly quadrupled over the course of the past 25 years whereas in the US, according to the CDC, over the past 25 years obesity rates haven't quite doubled. How is it that despite all this active transportation Great Britain's obesity rates are rising nearly twice as fast? 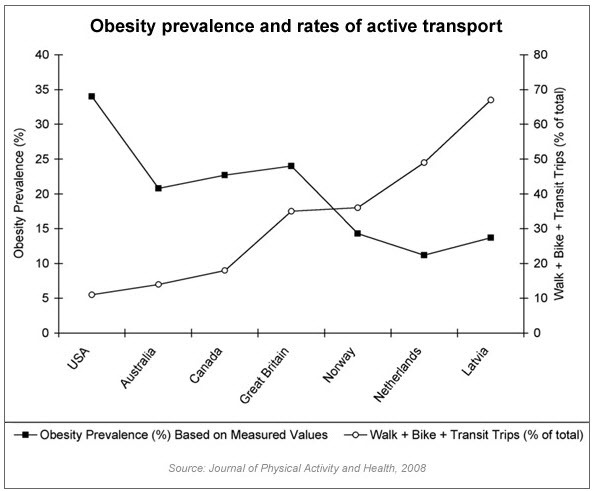 Correlation doesn't prove causation which is precisely why I'm not getting excited about this study and also why I'm not trying to claim that active transportation actually raises the rate at which countries gain weight. Comparing between countries isn't likely to be helpful as countries have widely divergent food and eating environments which if not controlled for, would make interpretation of results very challenging. Comparing within countries (cities and states) isn't likely to be helpful as folks who cycle to work likely live far healthier lifestyles than those who don't and would consequently have a multitude of factors that would contribute to their being slimmer than their driving neighbours. But maybe I'm making a fool of myself with this post in that the authors did explore all of these issues and really, walking and cycling to work are crucial. Don't think I'll lose sleep tonight worrying about that. Bottom line for me. Walking or cycling to work is an exceedingly healthful thing to do, and would in fact likely help you to manage your weight, but increasing bike lanes and walking paths aren't likely interventions that're going to impact a whole population, they're ones that might impact a small, already health conscious subset.